The Lagos State University (LASU) male soccer team has defeated its opponent University of Development Services (UDS), Ghana 1:0 in the finals of the inaugural African Students Football Union (ASFU) Soccer Championship, making them the 2019 ASFU champion. 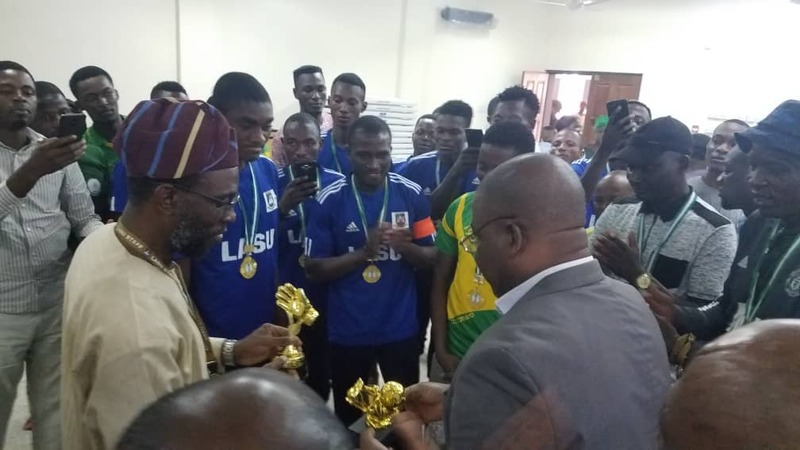 The Vice Chancellor, Professor Olanrewaju Adigun Fagbohun, SAN, on behalf of the entire Lagos State University Community congratulated the LASU students male soccer team and pledged more support to enable the LASU team represent Africa at the world stage in Russia later this year. After the final match on Sunday, a 300 Level Computer Science student of LASU, Oba David Durosimi won the highest goal scorer award with 6goals while a 300 level Mass com student of LASU, Saka Abdul-Azeez Abiola won best goalkeeper of the Tournament, team LASU also won the Fair play award. Prof. Fagbohun, noted that the victorious team’s showing has gone a long way to further prove that LASU’s gradual and steady rise to the summit of league of Universities in Nigeria is not a fluke, but a testament of the institution’s ability to compete and win in every sphere. The final match of the weeklong competition which saw team LASU defeat UDS, Ghana 1:0 was held in Adamasigba, Ibadan, Oyo State on Sunday, 27th January, 2019.